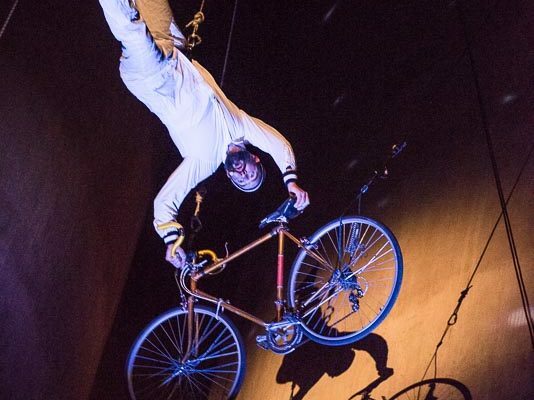 A spectacular performance event that changes each evening to reflect the day that was at the festival. Each evening the festival audience collect before the largest stage in their community to witness a changing performance that they have co-created with the visitors. 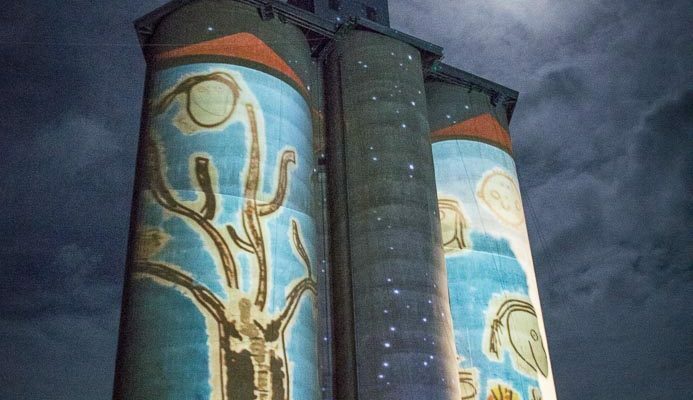 Dusk History: Before Vivid, White Night and Silo Art Trails, Y Space and a bunch of Natimuk artists have been using the local silos as their personal theatre, making spectacular performances in Western Victoria and touring it to other regions. 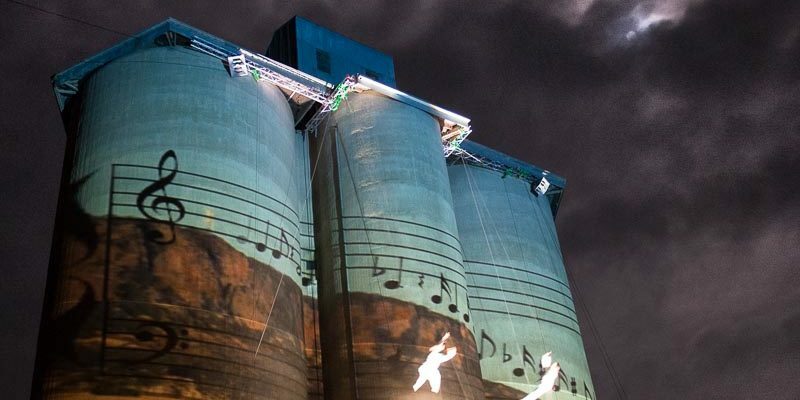 15 years of collaboration have seen them develop a unique visual language combining the enormous animated projections interacting with aerial antics, community performers and stunning shadow play. 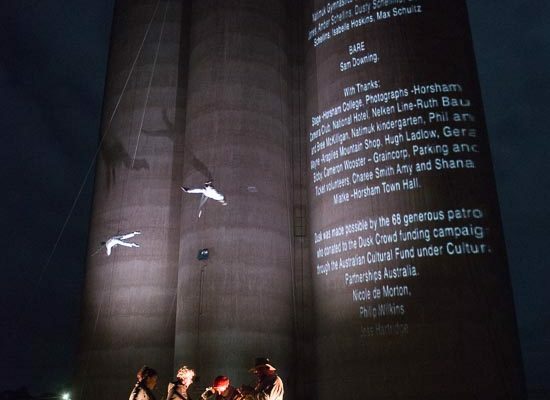 Dusk’s first incarnation was presented at the Nati Frinj Biennale with the generous support of Graincorp, donors through the Australian Cultural Fund – Creative Partnerships Australia, Creative Victoria and the Horsham Town Hall. 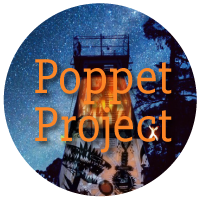 Presenter Perspective: “Dusk” – is a huge event that takes our unique visual language and puts it in the hands of the festival and it’s audience to co-create a performance that changes each evening to reflect their experience of their day at their Festival on their iconic structure. 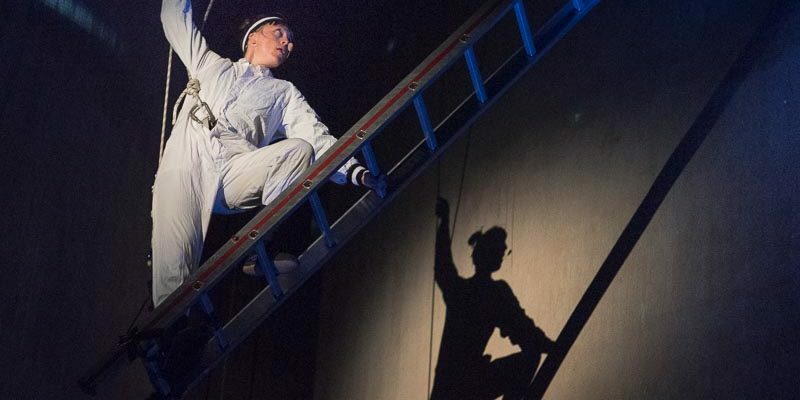 Dusk becomes a tool for the host festival to co-create with their audience to produce a spectacular series of performances co owned by all those who accept the invitation to participate. Can involve local artists collaborating with the Dusk Team. 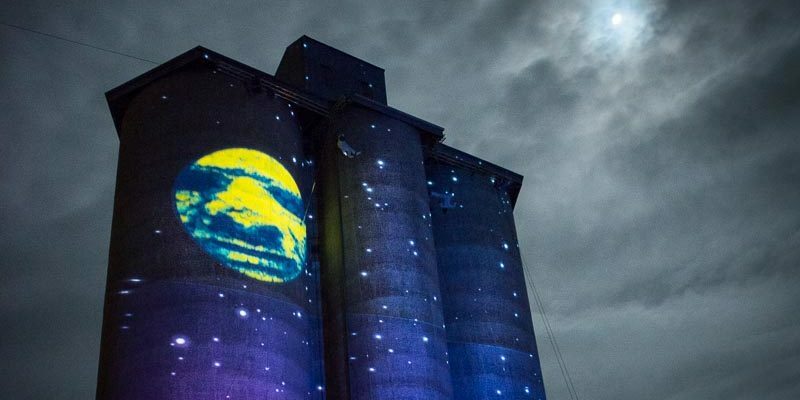 Audience Experience: Dusk is a spectacular performance event that takes interactive projections, aerial antics, stunning Shadow play and put’s it in the hands of you…the festival community. That’s right, every evening of your festival, you, the audience, gather before the largest stage in the region, under the vast southern sky and witness a different show each night, and what’s more… you get to help make it!! "Dusk aerial dance was like a memorable, unforgettable dream. " Requires Local Producer for community and festival liaison. May involve local artists collaborating with the Dusk Team. Reconnaissance of site = two visits. Residency period can vary in length depending on objectives of the festival...and hence budget. community meeting places for rehearsal.